Considering their epic offensive outburst to start the season, the Los Angeles Dodgers are somewhat reeling at the moment. Even with Sunday's win (LAD 7. MIL 1), the Dodgers have lost six of their last seven games, and they were outscored 35-29 in those seven games. The Dodgers placed seventh in Matt Snyder's latest MLB Power Rankings. Help is on the way though. Monday night the Dodgers will welcome ace Clayton Kershaw back from the injured list. He's been slowed by a shoulder issue since spring training, but will return to face Yasiel Puig and the Reds in Monday's series opener at Dodger Stadium. Kershaw made two minor-league rehab starts in recent weeks (one at Double-A, one at Triple-A) and things went well enough. With a veteran like Kershaw, he is going through the motions in rehab starts, not chasing results. The most important thing is he feels good physically and the ball is coming out of his hand the way he wants. "It was a little better than my last rehab start, so that was good," Kershaw told reporters, including ESPN, following his second rehab start last week. "Got to get through six innings, which was big. Got my pitch count up there, so next time I'll be ready to go." The Dodgers are currently without Rich Hill (knee) and Hyun-Jin Ryu (groin), which forced them to throw a bullpen game Saturday and perhaps stick Julio Urias in the rotation earlier than they wanted. Urias is coming back from major shoulder surgery and will presumably be on some sort of workload limit this year. Kershaw's return is coming at a good time. Injuries have become a theme for Kershaw in recent years -- he's been on the disabled/injured list five times since Opening Day 2016 -- and, at his age, it's fair to wonder how they will impact his effectiveness going forward. Granted, this year it was a minor shoulder problem in spring training, but it was still a shoulder problem, and that's worrisome. Here are two things to watch when Kershaw makes his 2019 regular season debut Monday night. Kershaw is essentially in spring training mode. He's still building arm strength. There will undoubtedly be an adrenaline boost once Kershaw toes the slab in an MLB game. Kershaw's command and secondary pitches are so good that he can be (very) effective with a 90-ish mph fastball -- last year he threw 161 /3 innings with a 2.73 ERA while averaging just over 91 mph with his heater -- but clearly, an 89-91 mph fastball is not the same as a 94-96 mph fastball. Given the nature of his injury (officially called shoulder inflammation) and his recent velocity trend, I'm curious to see where Kershaw sits Monday night. If he comes out of the gate at 90-91 mph, I'd consider that a good sign. That means he is back to where he was last year so soon after the shoulder injury and without a proper spring training. If he's down into the 88-89 mph range, then that's something to monitor going forward. 2. How much will he use his slider? Fastball usage all around baseball is trending down. It's ironic, really. There is more velocity in the game than ever before, yet pitchers are scaling back on their fastball usage because breaking balls and offspeed pitches are still harder to hit than a high-velocity fastball. "I think that a lot of times Clayton is driving that, the velocity, because I think that for us, he has so many different weapons that with his ability to command the baseball and sequence his weapons, he's still an elite, elite pitcher. And now when you're getting into the season and Spring Training, it's about getting guys out and he understands that. 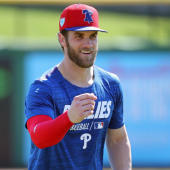 "I think that even if you look at the last couple years, he has sequenced a bit differently and Clayton is always open to trying to get better if it makes sense. So with his pitch mix, there's no reason he's not going to continue to be dominant." One start is only one start, but I am very much looking forward to seeing whether Kershaw ramps up his slider usage even more Monday night. Throwing more sliders than fastballs would not be unprecedented, especially not for Kershaw after last season, but the pendulum may not be done swinging either. As his fastball loses steam, throwing more and more sliders might be the best (only?) way for Kershaw to remain an elite pitcher well into his 30s. Because of the shoulder trouble, Kershaw did not have a normal spring training, so it might be a few starts until we can truly see what he's working with at this stage of his career. Is he an 88-90 mph fastball guy now? Will he continue throwing more sliders than fastballs? Velocity and pitch selection will both have an impact on Kershaw's long-term outlook, and Monday night will be our first chance to see him post-spring shoulder injury.